This is the last chapter of our story about a great egret that we gave a GPS tracking device on the Outer Banks of North Carolina in spring 2013 (see photo). We followed his movements for about 8 months and reconstructed his story with his GPS and ACC data (see parts I, II, III and IV). 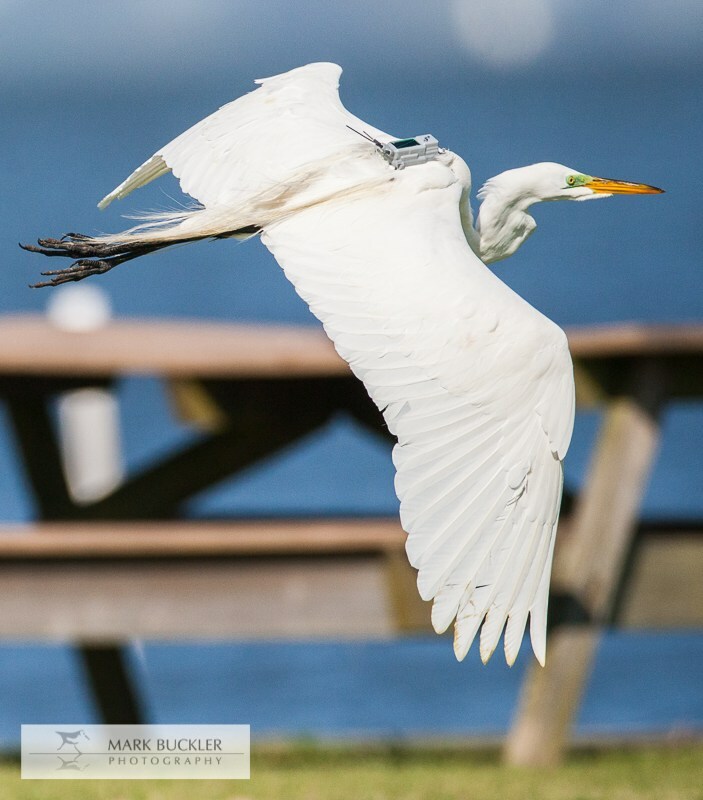 This was the first time that an egret’s migration has been recorded in such detail and, as you could see through this blog, we learned some quite amazing things about this bird. Mr. Bisbing had spent his summer within the Outer Banks, breeding and raising chicks with a mate, then taking it easy in the wetlands south of Roanoke Island. As the days became shorter toward the end of September, he started becoming unsettled, and on October 24th he took off, flying south over the open ocean. He migrated all the way down to Colombia, stopping for a few days in the Bahamas, Cuba, and Jamaica. Finally, when Mr. Bisbing arrived in Cesar Province, Colombia, our data show that he started foraging in the same routine manner detected while he was in North Carolina (Fig. 1). Figure 1. 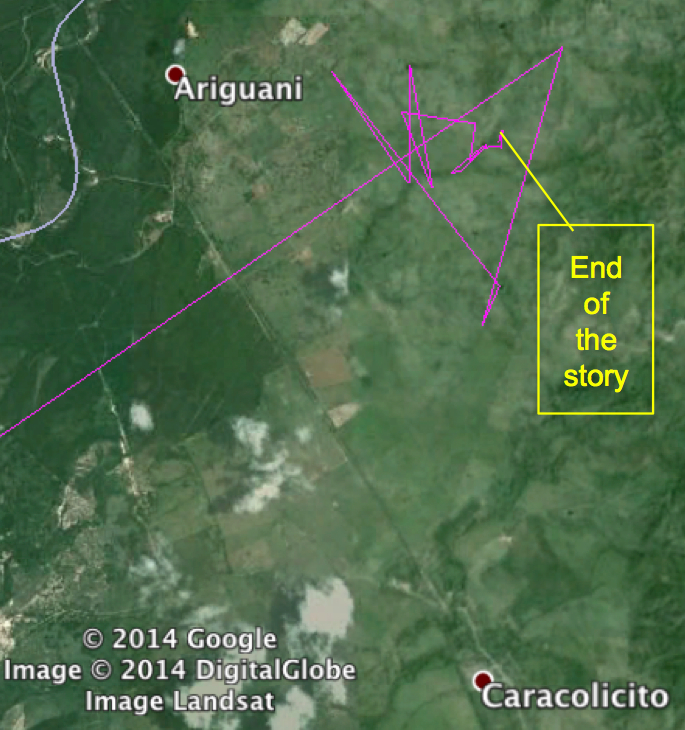 Mr. Bisbings last movements (pink lines) in Colombia. Suddenly, on Dec. 8th his movements stopped. His tag was still sending data, so it must have been in a sunny location to keep powering the solar panel of our tag. It took us a few days to realize that the tag had completely stopped moving, and that Mr. Bisbing had probably died, or possibly dropped the harness off his back. Our next challenge was to go to the site to see if there was a dead bird, and recover the tag, so that we could download the detailed data (the daily text messages from the tag to us just sent us a subset of the data) and analyze the results. We started asking around among colleagues and birders to find someone locally in Colombia who would be able to search for the tag at this the GPS location. On March 3rd, Mr. Curtis Smalling (Director of Land Bird Conservation, Audubon North Carolina) sent a note to the group, ProAves, a Colombian bird group, asking if anyone would search for the radio-tagged egret for us. On March 20th, Dr. Matthew Godfrey (sea turtle program leader, NCWRC) informed us that he gave all the information we had provided to him to his Colombian colleague, who in turn, posted the request on the Colombian Bird Network. On March 19th, we received an email from Magaly, who told us that she would search for the tagged bird! We found a biologist, who was willing to help us, far away in Colombia!!! She asked a few questions about the frequency of the tag and the exact GPS location, then started her search. She found the tag exactly where we thought it was, and also the feathery remains of Mr. Bisbing in Plot No. 16 of the San Miguel, Vereda, The Navajo town of El Copey Cesar, Colombia. We are very grateful that Magaly volunteered to take her time to recover and send the tag back to the Museum of Natural Sciences in Raleigh. But what caused Mr. Bisbing’s death? The area that he chose to forage in had been affected by an unusual summer with no rain in five months and the vegetation was very dry as evident in pictures from the area (Fig. 2). Figure 2. The area in which Mr. Bisbing died: Plot No. 16 of San Miguel, Vereda the Navajo, Town of El Copey Cesar, Colombia. The only water sources were man made wells for cattle. One of the farm workers (Fig. 3) reported to Magaly that he had seen the dead heron and its transmitter about two months before she arrived looking for it. He did not handle the dead bird but observed, that he “did not see any wounds on the bird”. Figure 3. Biologist Magaly Elizabeth Ardila-Reyes who recovered the tag and a farm worker who found Mr. Bisbing dead and unharmed on the ground. We assume that Mr. Bisbing died of starvation and exhaustion after the long migration. He chose a foraging area that didn’t provide enough food to recover from his depletion of reserves. Was he inexperienced in this area, or was it the unusual summer that turned his trip into a disaster? We will never know about this individual bird, but if we keep observing more egrets and follow their way through life, we will hopefully understand more about how and why they choose locations to spend the summer or winter, and what their preferred migration pathways are. We have tagged other great egrets and found that they each have an individual schedule and have quite different preferences regarding foraging areas or migration routes. You can see their movements on movebank.org and find out in which areas Ms. Palma, Mrs. Newbern, Mrs. Kelly, Mrs. Heller, Mr. Norvell, and Mr. Meadows preferred to live and migrate. With the detailed observation of Mr. Bisbing, for example, we found that at least this bird preferred migrating during the night. There are only a few observations of migrating great egrets reported prior to our study, and they stated that great egrets migrate during the night. We were pleased to find that these older reports were confirmed by our study. This new, detailed knowledge about breeding behavior, foraging preferences, migration pathways and timing, etc. will help us protect great egrets and increase their survival in our more and more urbanized environment. You can participate and help us in these efforts, too, by using a new application called Movebank. With this app you can follow birds live in real-time, and go out in the field to find the tagged birds, take pictures and send them back via the application. So give it a try, check out the location of the closest bird, get into your car and enjoy the search.